Trashformers ready a pedal-powered recycling bin for their parade debut Saturday. For revelers with an environmental conscience, the Carnival season can be a plastics minefield that you have to cross to enjoy the creativity and beauty of New Orleans’ biggest celebration. That’s very much top of mind as a group of us calling ourselves the Trashformers makes our parading debut this weekend. For decades, city and tourism officials proudly measured Mardi Gras’ economic success by how much trash we generated. More recently, concerned citizens — yours truly among them — have been trying to raise public awareness of the ecological impact of all that trash. Last year seemed like a turning point. The discovery of just how many tons of plastic beads wind up in a flood-prone city’s storm drains became a topic of media coverage and conversation over dinner tables and workplace coffee pots all across town. Through teamwork with a half-dozen other core volunteers, I helped launch a recycling initiative on the Napoleon and St. Charles Avenue parade routes. The Young Leadership Council, Republic Services, and The ARC of Greater New Orleans joined forces in setting up six tents along the Uptown route, places where people could recycle their cans, bottles, and unwanted throws. Beads went into crawfish sacks and other recyclables into clear plastic bags that we heaved up into trucks provided by Republic and ARC as we marched along behind the Krewe of Freret parade. Judging from the enthusiasm of the crowd, it was easy to see there was a lot of public support for a more sustainable Carnival. We had to turn away volunteers because we didn’t have the capacity to take them on, and the feedback from parade crowds was overwhelmingly positive. A separate initiative drew 15,000 folks to sign an online petition to ban plastic beads outright. 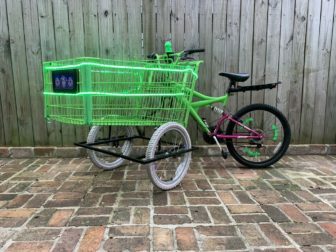 Some of the Trashformers will be walking, and others will be riding on distinctive neon green-decorated contraptions that fall somewhere between a tricycle and a shopping cart. Trashformers will encourage parade-goers to load these hybrid vehicles with cans, plastic bottles, go-cups and unwanted throws. Four of the inaugural members from last year’s volunteer recycling effort will be marching as Trashformers. 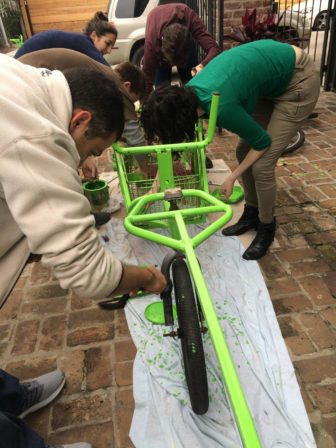 The founder of the krewe is, Brett Davis, a local architect, who has emerged as a leader in the movement for a more environmentally-aware Mardi Gras. The Trashformers idea was birthed at a forum Davis co-organized last October, called the Future of Mardi Gras. The primary focus was and remains waste reduction at parades. After the October forum, L.J. Goldstein, one of the founders of krewedelusion, approached Davis. Might there be a way for the krewe to build recycling right into its parade? Garza shares Davis’ sense that there’s a promising future for Trashformers, all across Carnival. Getting the word out is the first step toward building a culture in support of a more sustainable carnival, Garza said. The Trashformers are one of a growing number of local groups dedicated to promoting waste reduction during carnival. We hope to catch the eye of parade-goers with a creative approach that makes people want to participate in an environmentally sound effort. And this Saturday night, you can see it firsthand. Pitch in — and let us know how we do! Kevin Fitzwilliam is the owner/creator of Atlas Handmade Beads, a New Orleans company helping to move the Gulf South beyond plastic beads in favor of handcrafted necklaces made with recycled paper by women in Uganda (www.atlasbeads.com). He will be (Aluminum) Can-ie the Clown in the Trashformer segment of Saturday’s krewedelusion parade. He can be reached at info@atlasbeads.com.